Having a natural, beautiful look means a lot to you. That's the look of Clean Makeup. so the world doesn't see makeup, just the look of great skin. I've used this several times last December during parties and other occasions. I can't say it's really bad, its just so so. It was cheap, so I got what it's worth. * I chose the wrong shade (since I bought it online). It's lighter - looks like a liquid concealer, and this has more pinkish undertone to it. Since it's so light, almost non-existent, I still can make it work. * Although it's in a glass bottle, I hate the top cap. The hole is just too big. It spilled twice when I was using it. Squeeze type tubes or pumps are better. If you chose a lighter shade of foundation, you can make it work by applying a darker shade of powder closest to your skin tone. Another way to make it work, is to mix your liquid foundation with another liquid foundation that has a darker shade. Add the second foundation in little amounts until you get the shade you want. I will probably just finish this bottle so that it won't go to waste. I definitely won't recommend this to anyone. 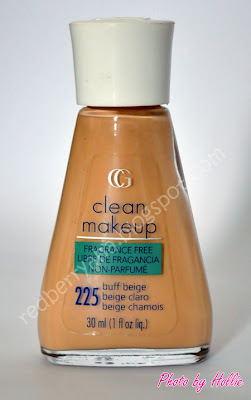 However, for younger ladies or teens, this might work since it has a very light coverage. I have read from other reviews that they had breakouts when they tried this product, so be careful. @kumi, I bought a lot of products from this ebay.ph seller. hindi naman katakot, her cosmetic prices are really very cheap compared to other ebay.ph sellers. The products I bought from her were really authentic and sealed! She's a power seller as well. Her husband is a foreigner so maybe most of her items are hand carried and not shipped - I think that's the reason why it's cheap, since she doesn't have shipment costs.